This article is about the Marian apparition and its veneration. For the church building, see Cathedral-Basilica of Our Lady of the Pillar. "María del Pilar" redirects here. For the name, see Pilar (given name). Our Lady of the Pillar (Spanish: Nuestra Señora del Pilar) is the name given to the Blessed Virgin Mary associated with the claim of Marian apparition to Apostle James the Greater as he was praying by the banks of the Ebro at Caesaraugusta (Zaragoza), Hispania, in AD 40. The celebrated wooden image is enshrined at the Basilica of Our Lady of the Pillar in Saragossa (Zaragoza). Pope Callixtus III granted indulgences towards her shrine in 1456. Since 1730, Pope Innocent XIII mandated her veneration throughout the Spanish Empire, and the Virgin Mary invoked under this specific Marian title is considered the Patroness of the Spanish region of Aragon and its capital Saragossa (Zaragoza), and of the Spanish Civil Guard. Ultimately, Pope Pius X granted the image its canonical coronation on 20 May 1905. Her feast day is 12 October, thus coinciding with Columbus Day, celebrated as the national holiday of Spain. Christian tombs in Saragossa, dating from Roman days, appear to bear images representing the Assumption of the Blessed Virgin. In the 4th century, the presence of votive images placed on columns or pillars is attested. The oldest written testimony of devotion to the Blessed Virgin in Saragossa (Zaragoza) is usually identified as that of Pedro Librana in 1155. There is evidence that the site attracted pilgrims from across the Iberian Peninsula during the 13th century, e.g. reflected in the work Milagros de Nuestra Señora by Gonzalo de Berceo, dated to the 1250s or early 1260s. The appellation Santa María del Pilar is attested for 1299. The claim that the first church had been the oldest in Hispania, built in AD 40 by James the Greater, is first recorded in 1318. The tradition of the Marian apparition can be traced to the 15th century: In either 1434 or 1435, a fire destroyed the alabaster altarpiece. The replacement altarpiece features bas-relief representations of the Marian apparition. The image of the Virgen del Pilar venerated today also dates to this period. It executed in the late Gothic style of Juan de la Huerta. Pope Calixtus III in a bull issued on 23 September 1456 declares a seven year indulgence for those who visit Our Lady of Saragossa. The text of the bull specifically mentions a pillar, for the first time suggesting the existence of an image known as Our Lady of the Pillar. The feast day of 12 October was officially introduced by the Council of Zaragoza in 1640. 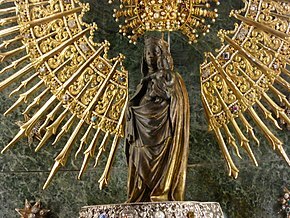 According to the account by María de Ágreda (d. 1665) in her Mystical City of God, Mary, mother of Jesus, was transported from Jerusalem to Hispania during the night, on a cloud carried by angels. During the journey, the angels also built a pillar of marble, and a miniature image of Mary with the Child Jesus. Of all the places that Spain offers for the veneration of the devout, the most illustrious is doubtless the sanctuary consecrated to God under the invocation of the Blessed Virgin, under the title of our Lady of the Pillar, at Saragossa. According to ancient and pious tradition, St. James the Greater, led by Providence into Spain, spent some time at Saragossa. He there received a signal favour from the Blessed Virgin. As he was praying with his disciples one night, upon the banks of the Ebro, as the same tradition informs us, the Mother of God, who still lived, appeared to him, and commanded him to erect an oratory in that place. The apostle delayed not to obey this injunction, and with the assistance of his disciples soon constructed a small chapel. In the course of time a larger church was built and dedicated, which, with the dedication of Saint Saviour's, is kept as a festival in the city and Diocese of Saragossa on the 4th of October. James returned to Jerusalem with some of his disciples where he became a martyr, beheaded in AD 44 during the reign of Herod Agrippa. His disciples allegedly returned his body to Spain. The year AD 40 is the earliest recognised Marian apparition in the Catholic Church, dating to a time when Mary, the mother of Jesus, was still alive. Pope Clement XII allowed the celebration of the feast of Our Lady of the Pillar all over the Spanish Empire in 1730. As the date coincides with the discovery of the Americas, the lady was later named as Patroness of the Hispanic World. A fire in 1434 burned down the church that preceded the present basilica. The construction of the present Basilica of Our Lady of the Pillar, Saragossa (Zaragoza) was started in 1681 and ended in 1711. The wooden image and pillar without the mantle (photograph taken on 2 April 2011; the image is displayed without mantle on the 2nd, 12th and 20th day of each month). The wooden statue of the Blessed Virgin Mary is in the Late Gothic style. It stands 39 centimetres (15 in) tall, on a pillar of jasper with a height of 1.8 metres (5.9 ft). The statue depicts Mary with the Child Jesus on her left arm, who has a dove sitting on his left palm. Some reports state that an earlier wooden image was destroyed when the church burned down in 1434, consistent with an attribution of the current image to Juan de la Huerta (d. 1462) or his school. It appears that folk belief in some cases may be inclined to regard the Saragossa image as miraculous, sculptured by the angels as they transported Mary from Jerusalem to Saragossa (Zaragoza); this mystical tradition goes back to María de Ágreda (d. 1665), herself the object of frequent "mystical bilocation" (i.e. she reported that she was often "transported by the aid of the angels" ), who gave an account to this effect in her Mystical City of God; however, unlike the tradition of the Marian apparition itself, the miraculous origin of the image is not part of the tradition recognized by the Holy See as canonical. Since the 16th century, the pillar is usually draped in a skirt-like cover called manto "mantle". As a whole, it is protected by a bronze case and then another case of silver. The image was canonically crowned in 1905 during the reign of Pope Pius X. The crown was designed by the Marquis of Griñi, valued at 450,000 pesetas (c. USD 2.6 million as of 2017). Our Lady of the Pillar is a common motif of the Madonna and Child in Spanish art; extant examples other than the Saragossa image date from the Renaissance period onward. Depictions become especially numerous following the introduction of the feast day throughout the Spanish Empire in 1730. The shrine of Our Lady of the Pillar in Fort Pilar Zamboanga City, Philippines (1734). 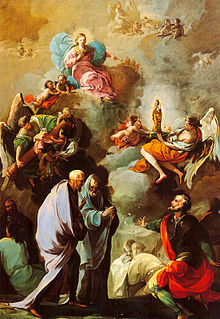 St. James and his disciples adoring Our Lady of the Pillar, painting by Goya (c. 1775–1780). Relief of Our Lady of the Pillar on the monument to Christopher Columbus in Columbus Square (Madrid, Spain), completed in 1885. The feast of Our Lady of the Pillar is celebrated on 12 October and she is the Patroness of the Hispanic peoples and the Spanish Civil Guard. A grand nine-day festival known as Fiestas del Pilar is celebrated in Saragossa (Zaragoza) every year in her honour. The modern Fiestas del Pilar, as they developed since the 19th century, begin on the weekend preceding 12 October and they end on the Sunday after 12 October (i.e. they move between 5–13 and 11–19 October). They were declared as a "national holiday of touristic interest" (Fiesta de Interés Turístico Nacional) by the Ministerio de Comercio y Turismo in 1980. As 12 October happens to coincide with the day of the year 1492 when land was first sighted on Columbus' First Voyage, the Fiesta de la Raza Española, first proposed in 1913 by Faustino Rodríguez-San Pedro y Díaz-Argüelles (in the USA later dubbed "Columbus Day", as Columbus tends to be considered Italian rather than Spanish in North America) falls on the same date. The Fiesta de la Raza Española was declared the national holiday of Spain in a decree by Antonio Maura and king Alfonso XIII of 1918. The alternative name Día de la Hispanidad was proposed in the late 1920s by Ramiro de Maeztu, based on a suggestion by Zacarías de Vizcarra. After the Civil War, on 12 October 1939, the Día de la Raza was celebrated in Saragossa (Zaragoza), presided by Francisco Franco, with a special devotion to the Virgen del Pilar. Chilean foreign vice-secretary Germán Vergara Donoso commented that the "profound significance of the celebration was the intimate inter-penetration of the homage to the Race and the devotion to Our Lady of the Pillar, i.e. the symbol of the ever more extensive union between America and Spain." The name of Día de la Hispanidad was introduced as the official name of the national holiday in a decree of 9 January 1958. During the transition to democracy, there was a proposal to shift the national day to 6 December, the day of adoption of the Constitution, but in the end, in a decree of 1982, the day of 12 October was retained, under the name of Fiesta Nacional de España y Día de la Hispanidad. In 1987, the name was reduced to just Día de la Fiesta Nacional de España. Pilar, short for Maria del Pilar, is a common Spanish given name, with name day on the feast of Our Lady of the Pillar. In the Philippines, ruled by Spain for over three hundred years, Our Lady of the Pillar is honored as the patroness of a number parishes and municipalities; seven are named Pilar in her honor. There are towns named Pilar in the provinces of Abra, Bataan, Bohol, Capiz, Cebu, Surigao del Norte and Sorsogon. As in Spain, her feast day is celebrated every 12 October. In Zamboanga City, the Virgin of the Pillar has been venerated for almost four centuries as the patroness of the city and in the Archdiocese of Zamboanga. The bas relief of her atop the eastern gate of the 17th-century Spanish military fort dedicated to the Virgin, Fort Pilar (Full name: Royal Fort of our Virgin Lady of the Pillar of Zaragoza, El Fuerte Real de Nuestra Señora Virgen del Pilar de Zaragoza), is now a Catholic Marian shrine. The city also has a street named after her – Pilar Street. In Davao City, a shrine in honor of Nuestra Señora del Pilar in Magsaysay Park was built through the collaborative efforts of Circulo Zamboangueño de Davao, a local group of transposed from Zamboanga City. Our Lady of the Pillar is the patroness of the City and Diocese of Imus, enshrined at the Imus Cathedral in Cavite province. The city celebrates its fiesta every October with the Karakol, a ritual dance-procession performed in fiestas around the province of Cavite. The image was canonically crowned on 3 December 2012. Don Rufino Alonzo Sr. Street Cotabato City, Maguindanao. Town of San Simon, Pampanga. Town of Mamburao, Occidental Mindoro. ^ accepted as canonical by the Sacred Congregation of Rites on 7 August 1723. ^ Nogués y Secall (1862), p. 30. ^ March, J.M. (1911). "Nuestra Señora Del Pilar" from New Advent: The Catholic Encyclopedia. New York: Robert Appleton Company. Retrieved 26 February 2013. ^ Lasagabáster Arratíbel (1999), p. 84. ^ Mª Carmen Lacarra, Apud Arturo Ansón Navarro y Belén Boloqui Larraya, «Zaragoza Barroca», en Guillermo Fatás Cabeza, (coord.) Guía histórico-artística de Zaragoza, Zaragoza, Ayuntamiento (Servicio de acción cultural), 1991, pág. 310. ISBN 84-86807-76-X. ^ Nogués y Secall (1862), p. 64, c.f. De Plancy (1852), p. 262. ^ Nogués y Secall (1862), 68. ^ "Nuestra Señora del Pilar", Catholic News Agency, October 12, 2017. According to Hyppolitus of Thebes, Mary lived for 11 years after the death of Jesus, dying in AD 41. Rainer Riesner. Paul's early period: chronology, mission strategy, theology. Retrieved 20 August 2011. . See also Dormition of the Mother of God. ^ (2011-10-12). "At the centre of Marian faith: Spain’s National Holiday and the Feast of the Virgin of Pilar". Custodia Terræ Sanctæ. Retrieved on 25 February 2013. ^ a b John M. Samaha, “Our Lady of the Pillar,” All About Mary. International Marian Research Institute, University of Dayton. ^ Carmen Lacarra, in: Arturo Ansón Navarro, Belén Boloqui Larraya, Zaragoza Barroca, Guillermo Fatás Cabeza, (ed.) Guía histórico-artística de Zaragoza, Zaragoza, Ayuntamiento (Servicio de acción cultural) (1991), p. 310. ^ based on the value "£18,750" given by March (1911), historical conversion rate from stephenmorley.org; about USD 5.3 million based on the historical gold standard of the peseta. ^ Real Decreto 3217/1981, Boletín Oficial del Estado del año 1982. César Cervera, ¿Por qué coincide la Fiesta Nacional de España con la Virgen del Pilar?, ABC, 12 October 2014. ^ "Ley 18/1987" (BOE 241/1987, p. 30149). ^ "Canonical Coronation of Nuestra Señora del Pilar | CBCPNews". CBCPNews. Retrieved 22 December 2017. Wikimedia Commons has media related to Our Lady of the Pillar.